IKEA moved its store location in Bergen, Norway, and they decided to ask for volunteers to help with the opening to engage with the community. Creativity reports that the agency SMFB used press, outdoor, banner ads, and social media to call them to action. Volunteers could sign up on its website to do favors such as making a speech during the opening, assisting the mayor at the ceremony, planting the first tree outside the entrance, hosting the customer radio, etc. More…. 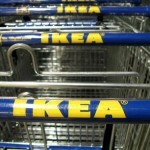 This entry was posted in General and tagged creative, crowdsourcing, ikea by admin. Bookmark the permalink.